RVHS freshman Lauren Twyman (20) drives the lane during the Lady Raiders 52-45 victory over South Gallia on Friday night in Bidwell, Ohio. SGHS junior Alyssa Creemens attempts a three-pointer during the Lady Rebels 52-45 setback to River Valley on Friday night in Bidwell, Ohio. BIDWELL, Ohio — And so it begins. The River Valley girls basketball team — which trailed by seven points after the first quarter — outscored the visiting Lady Rebels 41-27 over the remainder of the contest, as RVHS claimed 52-45 season-opening victory in Gallia County. South Gallia (0-1) utilized a 14-2 run to build the early advantage with 5:08 to go in the first quarter. The Lady Raiders (1-0), however, manufactured a 9-4 scoring run of their own to cut the deficit to 18-11 by the conclusion of the stanza. The Silver and Black continued their rally in the second quarter, as Sierra Somerville sank two free throws to give the hosts their first lead of the contest at 23-22 with 3:17 to go in the half. From there, River Valley furthered its advantage by way of a 9-4 scoring run to carry a 32-26 lead into the intermission. 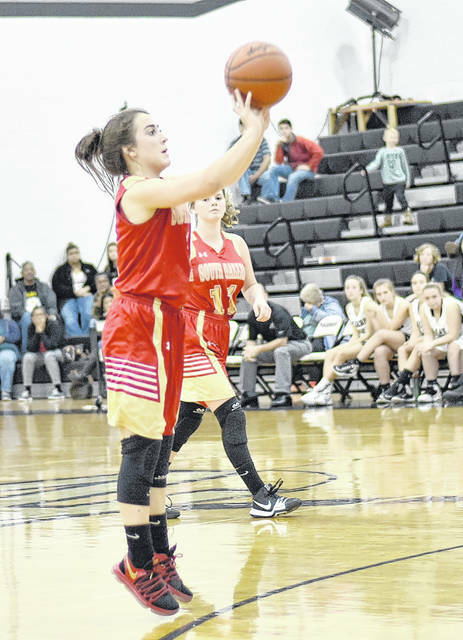 The Lady Rebels cut the deficit to one-point (34-33) within the opening three minutes of the second half, but the Lady Raiders ended the quarter with a 10-5 run and a 44-38 lead. Both squads struggled from the field in the fourth period, each going without a field goal until RVHS pushed its lead to 46-38, with 5:00 remaining in the finale, en route to seven-point, 52-45 win. For seventh-year SGHS head coach Corey Small, the key to success this season for his program depends on his group of returning players. River Valley attempted only nine more field goals than SGHS in the game, with the Lady Raiders shooting 20-of-64 (34.2 percent) including 1-of-13 (7.6 percent) from three-point range, and the Lady Rebels shooting 18-of-55 (32.7 percent) including 5-of-25 (20 percent) from long distance. From the free throw line, RVHS was 11-of-13 (84.6 percent), while the Red and Gold was 4-of-12 (33.3 percent). The Lady Raiders won the rebounding battle by a 40-to-31 margin. The visitors committed 26 turnovers in the setback, three more than River Valley. 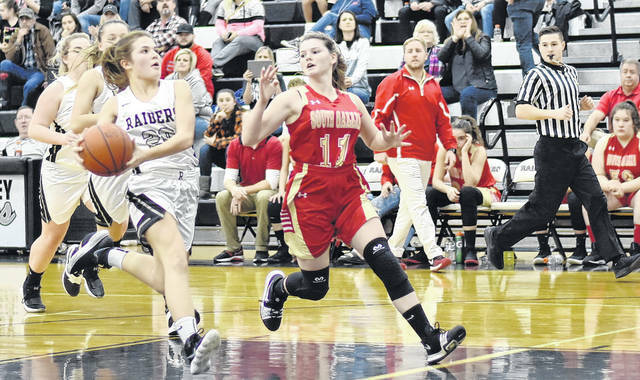 RVHS sophomore Hannah Jacks led the hosts with a 14 points, while Somerville, senior Kelsey Brown and freshman Lauren Twyman poured in 10 points apiece, respectively, for the Silver and Black. Beth Gillman added five points, including on trifecta, as Cierra Roberts provided two points. Kaylee Tucker concluded the scoring totals for River Valley with one point. Kiley Stapleton led the Lady Rebels with 14 points, including two trifectas and a 2-of-2 performance from the charity stripe. Christine Griffith was next with seven points, while Amaya Howell and Alyssa Cremeens finished with six points apiece, respectively. Olivia Johnson rounded out the scoring totals for the visitors with two points. The non-conference contest served as the first game of the 2018-19 campaign for both squads. The Lady Raiders return to the hardwood for their first road date of the season, as they travel to face Gallia County foe Gallia Academy on Monday. The Lady Rebels return to action when they tip-off for their home opener on Tuesday against Symmes Valley.